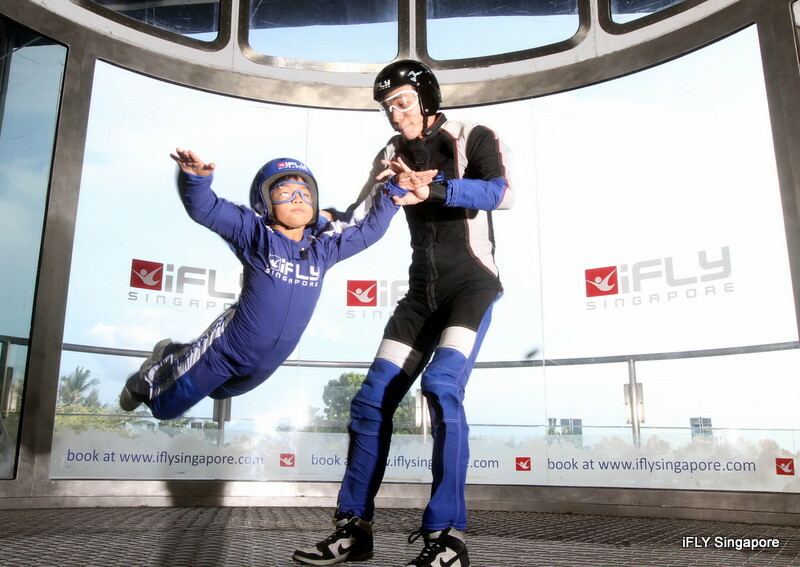 Be a Superhero with the iFly Experience! If you ever yearn to feel the rush of skydiving without any of the danger - the 3P's of plunging, parachutes and planes - then indoor sky-diving is definitely the way to go. 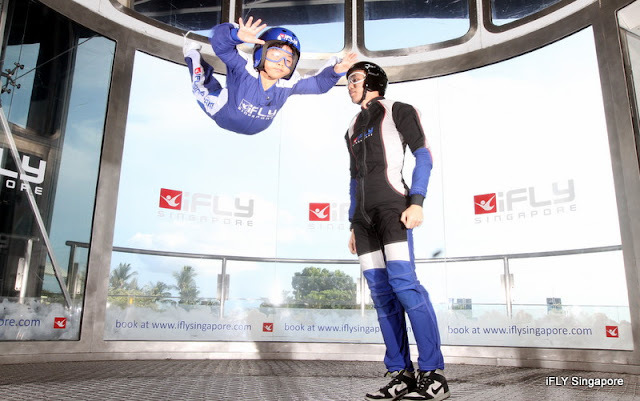 And with iFly Singapore, one gets to experience an unparalleled skydiving experience... as the boys found out! The entire flight experience mimics the process of going on a flight at the airport, which means everything begins from the moment the boys checked in 1 hour prior to their actual flight for compulsory flight training. Can you tell the boys are extremely excited? Oh, one thing about footwear - be sure to wear covered shoes with laces instead of slippers, sandals or crocs so that they will not fly off during the flight. So yes, the boys had to rent shoes from iFly due to inappropriate footwear. Oops. After a brief video introduction, the boys were led to a briefing room where the boys laid down on training beds for a crash course on basic flight positions. They were also imparted hand signals, which would help them communicate with the flight instructor within the wind tunnel as the noise of the fan will be so loud that earplugs are required. Then came possibly the most anticipated moment of the day - getting geared up. The boys changed into the professional-looking flight suits, followed by trendy glasses and hip helmets... and they were all set to rumble! Ayd stepped into the wind tunnel first and immediately, a sense of weightlessness took over. It was actually quite incredible to watch him 'float' in the air but as I found out from the boys later, it was tough work trying to adjust and stay in the optimal flight position. But they soon got the hang of it, and even managed to smile at my camera! Yes, and still can wave somemore. A basic package (from $89 onwards) will get you 2 skydives – each lasting for about 40 to 60 seconds. The flight time may seem short but that is the time it takes to fall through the air from 12,000 to 3,000 feet! For the boys' second round, the instructor took them so high up in the tunnel that I thought they were going to hit the ceiling! They then spun all the way down, much like horizontal ballerinas. And if you are like the boys who cannot get enough of the 2 skydives and clamour for more, be sure to let the instructor know at that instant as the rates for extra skydives are charged at a lower rate of $30 per skydive. At the end of it all, the boys were presented with their own certificates which contributed to their already-smiling faces. It may seem a tad pricey for an 1.5-hour long activity but compared to the price of skydiving from a plane, it is sure a bargain! And best of all, indoor skydiving provides all the thrills of a free fall, but in a controlled environment. Rates: $89 and up for 2 skydives. Book 2 days in advance via online for cheaper rates.